Washington’s Grant Kuhlwein makes the return during a first singles match against Frontier Athletic Conference opponents Jackson at Gardner Park Tuesday, March 26, 2019. 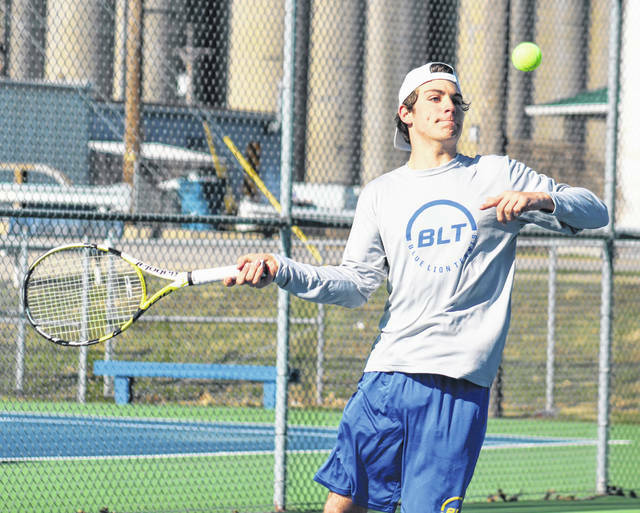 After having what would have been their season-opening match against Logan Elm rained out on Monday, the Washington Blue Lion tennis team welcomed the plentiful sunshine and the Jackson Ironmen for a Frontier Athletic Conference match at Gardner Park Tuesday afternoon. In spite of the pristine blue sky, temperatures hovering in the low 40s and a continual light breeze made it feel even colder. Jackson won the match, three courts to two. At first singles, Washington’s Grant Kuhlwein defeated Mason Sheets, 6-2, 6-2. At second singles, Ryan Elrich lost to Jackson’s Carson Strange, 1-6, 3-6. At third singles, Jackson’s Garrett Turner defeated Josh Cartwright, 6-0, 6-0. At first doubles, Washington’s Ty Rose and Garrett DeWees beat Raymond Armstrong and Colt McManis in three sets, 6-4, 3-6, 6-2. At second doubles, Washington’s Sam Schroeder and Olivia Wayne lost to Stephen Marshmont and Patrick Henry, 5-7, 3-6. Washington’s match at Unioto, scheduled for Thursday, has been postponed due to the number of band members on the tennis team who will be marching in the Opening Day 100th annual Findlay Market Parade in Cincinnati. Washington will play at Jamestown Greeneview Monday and return home to face Chillicothe in the FAC Tuesday at 4:30 p.m.